Cordova High School will be hosting its annual early season track meet “The Clarke Massey Memorial Relays.” This meet is a fun way for our athletes to get some early season competition and training in without the pressure of a big meet. You can access the Clarke Massey Relay Heat Sheets here. UPDATE: Spectator Entry Fee: Adults-$6.00, Student/Senior -$4.00. There are two entries into the stadium – Team entrance is for athletes and coaches in uniform only! Tell your assistants to have on team apparel. Please drive down Chase Drive. Just past the Performing Arts Center (PAC) – just before you enter Hagen Park on the right – you will see Lancer Lane on the right before the park. Athletes must compete in the team uniform. All members of a relay must be dressed the same (matching jersey and shorts). If competing in spikes, spikes must be ¼” pyramid only (no needles, or christmas tree). DRESS WARM! We will follow a rolling event schedule for running events. Please arrive by the times listed below for your event! (approximately one hour prior to event). The weather has been cold and wet this week, but the athletes have worked hard and practiced through the weather. With the new Rio Track Stadium not quite complete we will continue to use El Camino High School’s Facility as needed. We anticipate using the El Camino Facility through early to mid-March. With the need to balance different disciplines of Track and Field workouts with having coaches available at both Rio and El Camino we have broken out the practice schedule by discipline/event type. Coaches will continue to communicate practice times and changes to the athletes however, you can check riotrackxc.com (https://riotrackxc.com/) for the current Track & Field calendar as well as any news updates. Additionally, if you use Google Calendars, you can add the Rio Track & Field calendar (https://calendar.google.com/calendar/r?cid=riotrackxc@gmail.com). MONDAY (2/18) – Sprint & Field Events Group Practice at ECHS from 3:30 – 5 p.m. Distance Group Practice at RAHS from 3:15 to 5 p.m.
WEDNESDAY (2/20) – Sprint & Field Events Group Practice at ECHS from 3:30 – 5 p.m. Distance Group Practice at RAHS from 3:15 to 5 p.m.
THURSDAY (2/21) – Sprint & Field Events Group – NO PRACTICE. Distance Group Practice at ECHS from 3:30 to 5:00 p.m.
FRIDAY (2/22) – Sprint & Field Events Group Practice at ECHS from 3:30 – 5 p.m. Distance Group Practice at RAHS from 3:15 to 5 p.m. Distance Group Practice at RAHS from 3:15 to 5 p.m.
We will be kicking off our season with the Clarke Massey Relays held at Rancho Cordova High School. This is an invitational meet and a limited number of athletes will participate. You can locate meet info on athletic.net. We are working on our meet entries and will have this finalized shortly. The Coaches will inform Athletes who will be entered by Monday, February 18th. This meet is being held on the Saturday at the end of President’s week, if your athlete can not make this meet please have them inform the coaching staff! The following schedule ONLY applies to runners who have qualified for the Section meet on Saturday, November 10th. 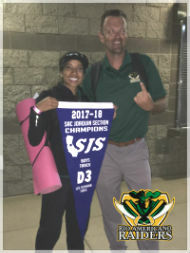 The Rio Varsity Girls finished in 4th Place and the Rio Varsity Boys finished in 5th Place at the 2018 CIF Sac-Joaquin Section Sub-Section Cross Country Meet on Saturday, November 3, 2018 (View race results) and qualified for the CIF Sac-Joaquin Section/Les Schwab Tires Cross Country Meet on Saturday, November 10, 2018 at Willow Hill Reservoir/Folsom High School. The 2018 CIF Sac-Joaquin Section/Les Schwab Tires Cross Country Meet for Division I-II-III-IV-V will be held on Saturday, November 10, 2018 at the Willow Hill Reservoir Cross Country Course adjacent to Folsom High School. Park in the Prairie City Road parking lot near the football field. Do not park in the small lot near the course. Folsom High School will charge $5.00 per vehicle for parking. Also, do not park in the Treehouse Shopping Center across from the high school. Results will be provided by Redcap Timing. State Qualifying: Varsity boys and varsity girls will qualify 3 teams and 5 individuals not already qualified as a team. Meet details including course map can be found at cifsjs.org (.pdf). The end-of-season banquet will be held on November 15th at The Old Spaghetti Factory in Rancho Cordova (12401 Folsom Blvd, Rancho Cordova, CA 95742) starting at 6:00 p.m. Menu options and payment details will be sent via email to those who submitted their RSVP form last week. If you checked out a uniform for the Xc season and have not qualified for sections please return to coach Anton after school this week. Athletes who don’t return uniforms will be charged a fee of $60. IMPORTANT/SAVE-THE-DATE: The End-of-Season Banquet is scheduled for Thursday, November 15, 2018 at one of the area The Old Spaghetti Factory restaurants. Please RSVP as soon as possible so we can find the right location for the size of our party. Congratulations go out to Sophia Karperos, Connor Ettinger, Jensen Salvatori, Lauren Calcagno, Katie Newton, and Kaylee Barnes for earning All-League honors at the CAL League Finals meet on October 24, 2018 at Folsom High School/Willow Hill Reservoir Community Park. In the Frosh/Soph races, Top 10 performances were turned in by Katie Hardwicke, Josie Perez, Sophia Newcomer, Ava Cardwell, and Nathan Gauthier. Team results are pending as of this writing and under review. 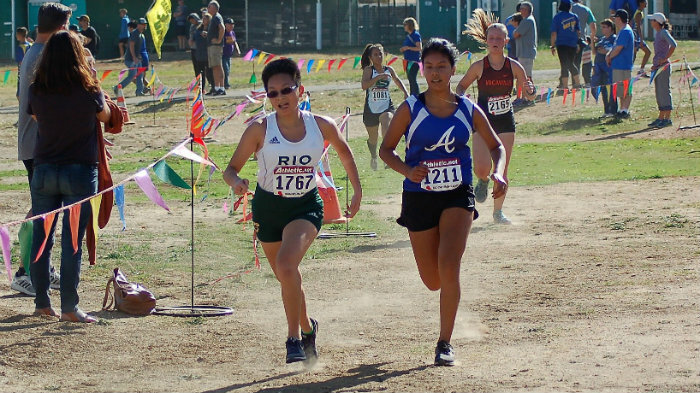 The 2018 CIF Sac-Joaquin Section/Les Schwab Tires Sub-Section Cross Country Meet for Division I-II-III-IV-V will be held on Saturday, November 3, 2018 at Frogtown, which is located on the Calaveras County Fairgrounds, 2 and 1/2 miles south of Angels Camp. Volunteers are needed for this meet. Rio will be assisting in course monitoring. Two shifts are needed. Please contact Coach Anton (916-801-8110/antonescay@hotmail.com) to throw your volunteer hat in the ring. Frosh/Soph and JV runners should plan on arriving at the venue by 8:00 a.m. Varsity runners should plan on arriving NO LATER THAN 10:00 a.m. Parking is $5 CASH this year, so please plan accordingly. Section Qualifying: Varsity boys and varsity girls will qualify 10 teams and 10 individuals. Sub-section meet entries by event (.pdf). Mark your calendars! The end-of-season banquet will be held on November 15th at either The Old Spaghetti Factory in Rancho Cordova, on J Street, or on Watt Avenue. Each restaurant can only hold a certain amount of people so we need your help. Please RSVP as soon as possible so we can find the right location for the size of our party. Details to follow once we tally the results. Students will have a staggered Early Dismissal. Frosh / Soph will have a 1:15 dismissal, Varsity will have a 2:15 dismissal. We would like all athletes at Willow Hills no later than 1 hour prior to their race start. There is no school provided transportation for this meet, please coordinate transportation for your athlete. School Administration has asked us to remind parents that it discourages students giving other students a ride. If you are having your student athlete get a ride from another student, you must have a note from a parent of both parties authorizing this. Additionally, please remember California State Law requires a driver have their license for 1 year prior to driving with others in the vehicle. We will have a tent set up in bleachers for athletes and parents to be together and cheer on the team. Look for the Rio Raiders tent! Parking can be accessed through Folsom High School parking lot. Please be aware that this is a school day and you will be arriving prior to Folsom High dismissing at 3:03PM. Please allow time to park when arriving. All Athletes will have an Early Dismissal at 1:15 or 2:15 depending on which event they are competing in. The meet schedule is listed below, this is a league meet with only 4 races total being run. Coaches want all athletes at the meet for all races to cheer on your teammates! The athlete competition roster is at the bottom of this information. We will have the Rio XC Team Tent set up in the team camp area. REMINDER: Photos, videos, and other highlights can be found on the Rio Track & Field + XC Facebook group. Congratulations go out to the Varsity Girls who won the HOKA ONE ONE Postal Nationals Flagship Event held at Jesuit High School on October 17, 2018) with a total time of 59:10.8. Rio was led by: 1. Sophia Karperos 11:17.9, 2. Lauren Calcagno 11:29.7, 3. Katie Newton 12:00.2, 4. Kaylee Barnes 12:10.3, 5. Alyssa Escay 12:12.7, and 6. Lucy Prieto 12:17.98. 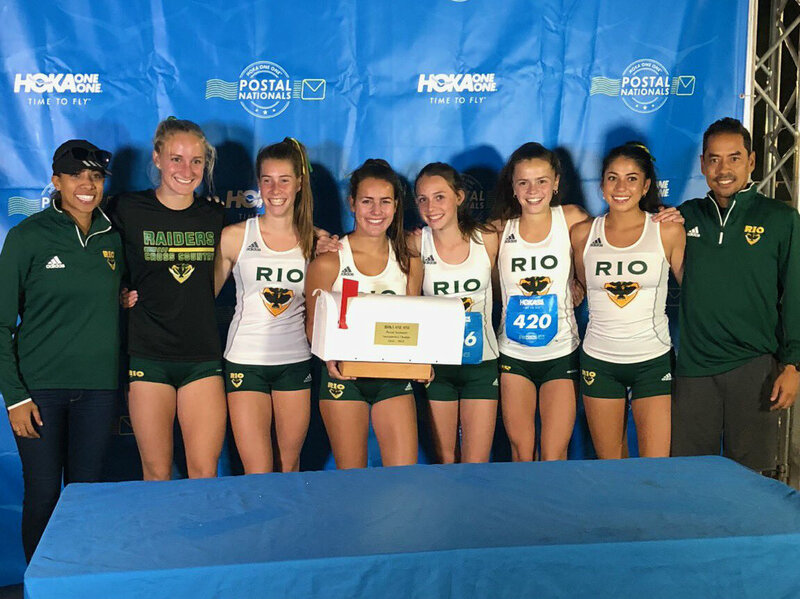 The Rio Varsity Girls are ranked 3rd Nationally in the HOKA ONE ONE Postal Nationals. Facing a very stacked field, the Varsity Boys took 3rd at the HOKA ONE ONE Postal Nationals Flagship Event. PRs were set all around and three Runnin’ Raiders broke 10 minutes. Rio was led by Jensen Salvatori’s 9:43.00 (4th All Time at Rio) and Connor Ettinger’s 9:43.92 (5th All Time at Rio). The race of the night went to Reed Moore who broke 10 minutes (9:59.29) with a masterful display of negative splits moving from the back of the pack to a solo win topped off by sub-60 second final lap. It was a treat to watch. The Rio Varsity Boys are Ranked 5th Nationally in the HOKA ONE ONE Postal Nationals. Congratulations, boys. Videos of each heat can be found at www.hokaoneonepostalnationals.com. Our league Championship meet is this Wednesday, October 24, 2018 at 3:00 pm at Folsom High School (Willow Hill Reservoir XC Course). We will be sending out meet information by Monday, October 22, 2018 with specifics including competition rosters and early dismissal information. League meets are run by the coaching staff and volunteers from each of the teams in the league. Rio along with Capitol Christian have been assigned to be course monitors. We will need 3-4 parent volunteers to be positioned to assigned spots on the course to monitor athletes. This is a great way to get out on the course and watch the action! If you are willing to volunteer to do this, please contact Coach Anton or Coach Lea. You will need to be at the meet by 2:30 for the volunteers meeting and be on the course monitoring from 3pm until approximately 5:00pm. There is no school provided transportation for this meet, we plan on having kids walk over from Rio (.5 Miles) after school. There is a group of approximately 25 boys who will need an early dismissal. We have attached the early dismissal list below in the competition roster, due to the fact that we wish to have our athletes miss as little school as possible we will have 2 separate groups of early dismissals. Team parent, Jorge Prieto, will meet the early dismissal groups at the flagpole and walk them over to the Jesuit Track. There will be a tent set up in bleachers for athletes and parents to be together and cheer on the team. Look for the Rio Raiders tent! Jesuit gets out of school at 3 PM so any time before 3:30 PM we would ask that you do not try to park on the campus as all spots are occupied by students. The athletes will be walking over from Rio, parking at the Rio Americano lot and walking over might be easiest for parents. If you wish to park at Jesuit, please park and drop off before 3:30 PM at the south entrance via American River Drive (Google Maps – 4739 American River Dr. Carmichael CA, 95608). There is a small lot and the streets are available. After 3:30 PM feel free to park via the Main Entrance (Google Maps – 4460 Fair Oaks Blvd, Carmichael CA, 95608). 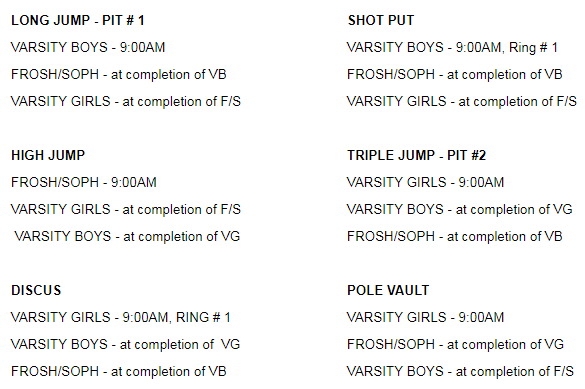 The meet schedule is here while the competition roster can be found here. Coaches ask that all athletes not on early dismissal arrive at the meet at least 1.5 hours before their scheduled start time. This will allow for proper warm up and to help cheer on their teammates! We will have the Rio XC Team Tent set up in the bleachers. All warmups for runners will take place in the field behind the visitor bleachers on the south side of the stadium. Access to that field is available at the gate on the east end of the non-press box bleachers. The infield of the track will not be accessible to athletes and spectators. Field access for races will occur at the gate near the start and finish line. located at the western end of the press box side bleachers. Athletes are expected to enter there just prior to their race and exit back into the bleacher areas immediately upon finishing. Entrance free to all. A snack bar will be open for food and drink but please no food or drink on the track or the turf.